Open your web browser, type https://icomoon.io/, and press the Enter key. Move your mouse cursor to the top right. Click the red IcoMoon App button. 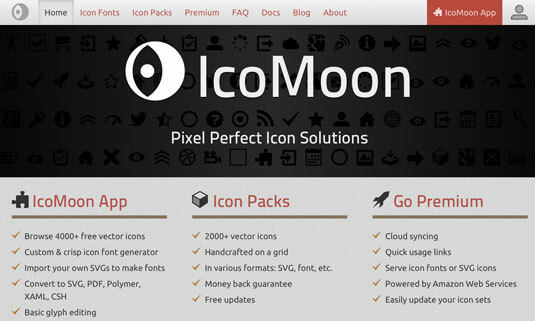 By default, IcoMoon displays a free set of icons. Click each icon that you want to add to your web site. Move your mouse cursor to the bottom left. Click the Generate SVG & More button. A page appears that lets you review your selections. Review the selected icons. Then move your mouse cursor to the bottom right again and click the Download button. IcoMoon generates a package that you need to download. Save this file to your computer in a folder named Downloads. Navigate to your Downloads folder. If you saved your file here, you should see a folder named like this: icomoon12345. Right-click the IcoMoon package folder. On a PC: click “Sent to”→”Compressed (zipped) folder”. On a Mac: click “Compress icomoon12345”.